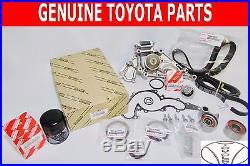 LEXUS / TOYOTA NEW COMPLETE OEM FACTORY TIMING BELT KIT. PLEASE SEE APPLICABLE LIST FOR MODELS. (IF YOU NEED HELP PLEASE INQUIRE IF YOU'RE NOT SURE OUR TOLL FREE NUMBER IS 866.970.9705). PLEASE DON'T SETTLE FOR AFTERMARKET PARTS. OUR HOURS OF OPERATION ARE. WE HAVE OVER 20 YEARS OF LEXUS AND TOYOTA EXPERIENCE. VEHICLE IDENTIFICATION NUMBERS (VIN) IS VERY HELPFUL WHEN ORDERING A PART. LET US HELP YOU FIND WHAT YOU NEED. OUR POLICY IS VERY SIMPLE. THE BOX/BAG HAS TO BE IN GOOD CONDITION. CAN NOT BE RIPPED, MARKED OR HAVE ANY DEFECTS. THE PACKAGING CAN NOT BE DAMAGED. ELECTRICAL PARTS ARE NOT RETURNABLE. IF YOU HAVE A QUESTION REGARDING ANY ITEM, PLEASE FEEL FREE TO ASK US. 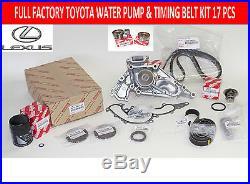 The item "LEXUS TOYOTA FULL ALL GENUINE OEM WATER PUMP TIMING KIT PUMP BELT 4.3 & 4.7" is in sale since Friday, March 08, 2013.